Born in 1958 and grew up in the east of the Netherlands with Dutch and Polish culture. She inherited the best of both cultures from her parents. Even when she was young her attention was paid to beautiful things. She can remember how as a little girl she was standing in front of a shop window with her mother and was caught by a ring studded with beautiful sparkling rhinestones. Or her first theatre visit. A little girl sinking into the red plush chair. A magical feeling and an experience to remember. The rich Polish culture and its colourful folklore have always played a major role in her life and her earliest memories to this run like a thread through her artistic life. When cleaning up the family home her mother found a school notebook. Mirjam was only eight years old when she had to write an essay for school titled: When I grow up I will be..... Mirjam wrote: "When I grow up I will be an artist." 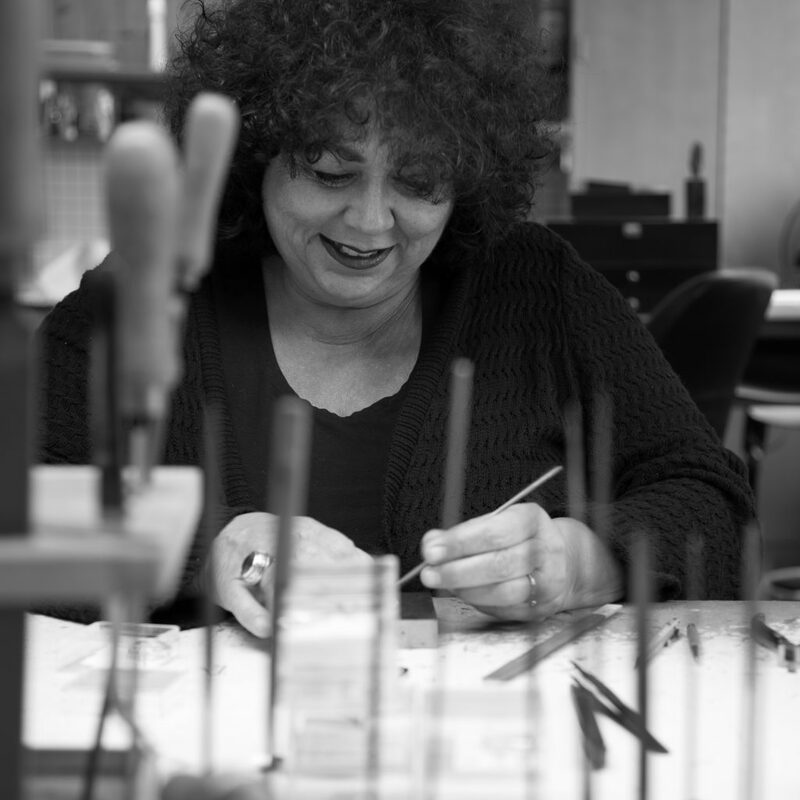 Her preference is given to working with metal, mostly organic with artistic design. Strong intuition for beauty, love for craftsmanship and attention to symbolism; you see it all in her work. was born in 1955 and raised in Rotterdam. As a boy he came in contact with jewellery making during crafts lesson at school. Silver thread with enamelled copper to be exact and that is where his dream to become a goldsmith began. Soon, he went to work at home and his homemade jewellery were worn not only by himself but also by family and friends. Apart from a very great enthusiasm he also had the talent to actually be a goldsmith! He attended professional training in Schoonhoven and at the Art Academy. 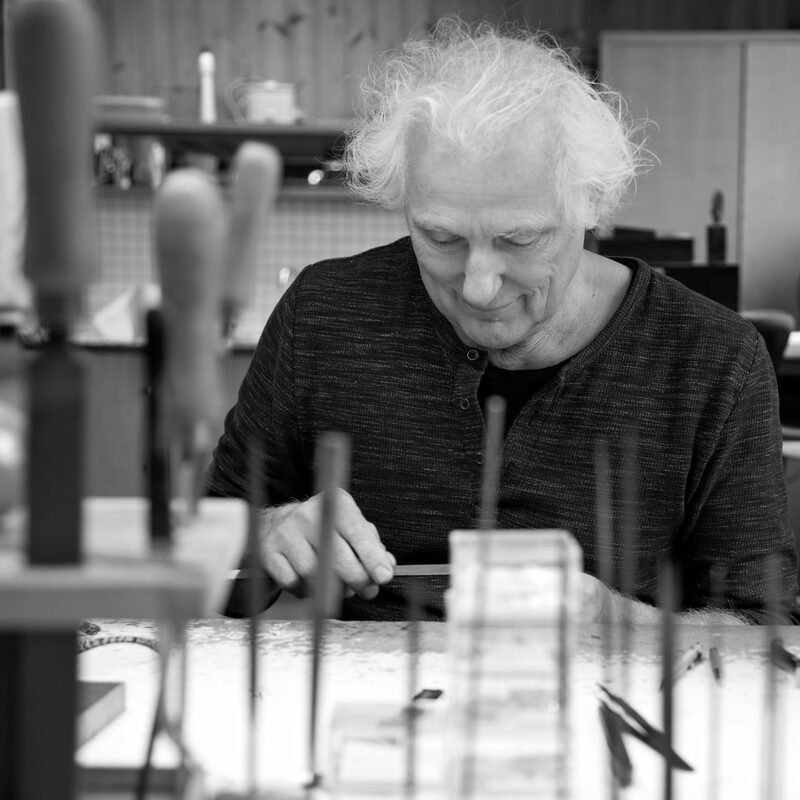 His career is a childhood dream that turned him into an established artist/goldsmith. He likes to use precious metals along with precious stones to shape his designs. His unique artistic creations show a great sense of beauty and perfection and witnesses of craftsmanship and originality. Gems that not only make the heart of the wearer beat faster but also make René´s heart beat faster. A thoroughbred artist!